It has been one year today since you left... and I don't miss you any less. I miss you every second of every day. I miss your hugs, the way you smell, the softness of your fur, your three little braids, and the way you'd rest your head over my shoulder. I miss the butterflies I felt when I was with you and how you made me feel so safe.. like a child home in mother's arms... and I miss the comfort of your love and strength . I just miss you. Yes, I've missed you my sweet girl. But I finally understand why you had to leave me though. I felt it then, but I know now beyond any doubt that you were my special angel... sent by God... my very own angel. And I realize that you were never meant to be with me for more than a short time here on Earth. But somehow you've always been with me, and will always be. That is so obvious now looking back.. after all your health issues were resolved, you had that awful accident that broke your leg. We sent you to the best surgeon in the world, but even so, the surgery failed only a week later and despite my pleading, they had no choice but to take you. You were with me just long enough to show me all that you had come to teach me. You gave me so much, but even after your death you kept sending me gifts and signs... beautiful signs. Because of you, my faith was renewed and strengthened... because of you, my relationship with Martha grew into a beautiful friendship... because of you, we went on to rescue other horses. Because of you, I found opportunities to pay it forward and to share just a bit of the love you gave me with others... and because of you, my world will never ever be the same. Ever. Proof of God's love, your story has changed not just my life, but the lives of many. I continue to receive personal stories from people around the world who have been inspired to rescue a horse, make a donation, or volunteer their time to help horses in need... and all in your name. There was even a little girl who had been following our story and decided that for her 11th birthday, instead of birthday presents, she would ask everyone to bring items to donate to the local horse rescue... and instead of having a party, all of her guests joined her in delivering these items to the rescue. The photos her big sister sent me will forever stay in my heart. 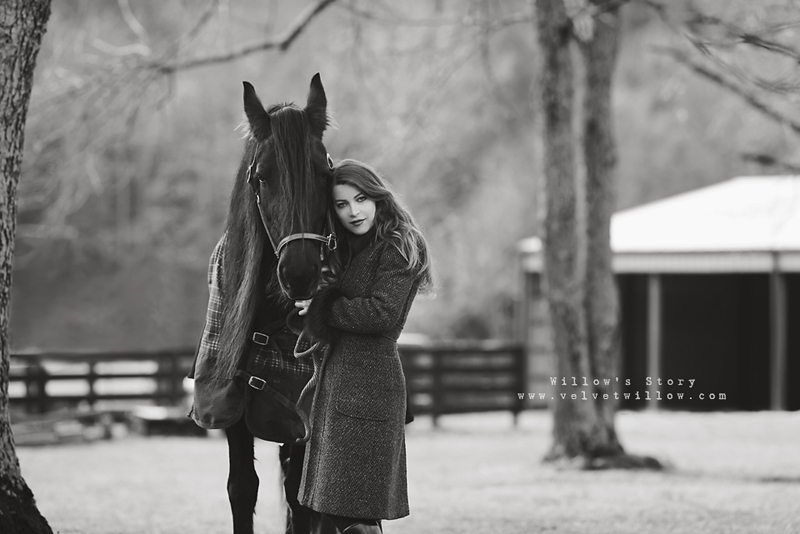 "Shana, I grew up with horses until the age of 10 when my mother left me and I ended up in foster care. For 46 years I put that life behind me, and while I still loved horses, I never allowed myself to get close to them as it brought painful memories back. Your love story with Willow changed all of that for me. I am riding again and giving my talent of photography to those around me who ride. I want you to know that Willow, through your writings, saved me as well. I'm glad she continues to bless you. Merry Christmas to you and your family." Yesterday in church, when everyone was praying silently, I was so lost in prayer and thinking about you that I didn't even notice Martha had stood up... until she bent down and whispered in my ear, "Listen, Shana... this is the song I used to sing to Willow." I opened my eyes and heard the beautiful words "How Great Thou Art..." Martha and I looked at each other and no words were necessary. I've never heard that song at this church before... in fact I haven't heard it since the last time Martha sang it to you. To us. And I flashed back to those cold days last winter out in your pasture, us comforting you as you struggled... And Martha singing those words ever so softly... "How Great Thou Art..."
My beauty, my Velvet Willow... I love you. Thank you for rescuing me. This was beautiful. I love that you will always have Willow in your heart. Beautiful letter to Willow. I randomly found your blog I think through 3 Peanuts blog? Anyways, I have never had horse or been exposed to horses but your stories have made me very interested. Thank you for sharing your passion! Wow just wow .. It's amazing how a simple blog has touched so many and saved so many. I do believe that is why she was placed in your life and you heart is open enough to let Gods spirit and will be done. Saw your facebook post and came to read Willow and your story. I cried tears of hurt and pain for her and you and then tears of joy that you found Mira. Thank you for the beautiful story of your rescue. You have a way of conveying all your joy and sorrow. I will forever remember Willow and your love. I can't believe its been a year, a beautiful soulfull angel, what a blessing it is you shared her with us!